The 25th edition of the PDC Darts World Championship was played from 14 December 2017 until 1 January 2018. Again, 72 players took a shot at the World Championship title. Michael van Gerwen can not occur that this years title goes to England. 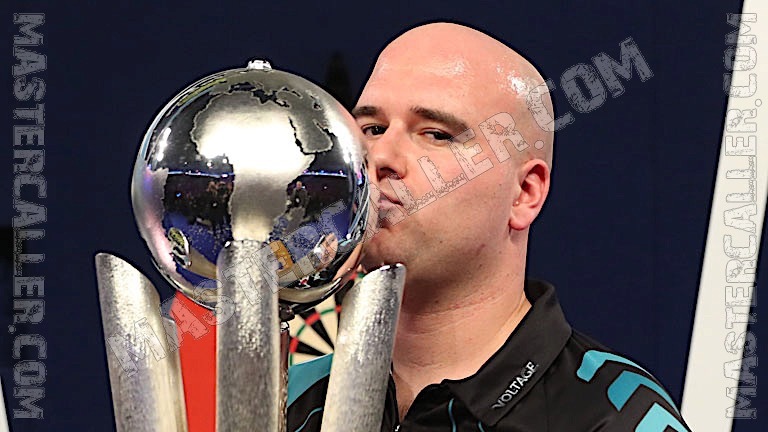 Rob Cross gives the tournament a farytale ending by winning the World Championship on his debut. In the final, Cross beats Phil Taylor who plays his last match ever on the World Championship stage. In the first round, a lot of seeded players can not reach the next round. Big names like Adrian Lewis, Dave Chisnall, James Wade and Jelle Klaasen all losing their first match. Kim Huybrechts had no chance to win against James Richardson (0-3) and Benoto van de Pas does not pass against Steve West. For the first time in years, a couple of players who had to start in the prelim round reaches the second round. Kevin Munch, Jamie Lewis and Paul Lim all take a victory against seeded players in the first round. Also in the second round some big names are eliminated. Number two of the placement list, Peter Wright, is surprised by an unleashed Jamie Lewis. The young Welshman plays the game of his life and goes with an average of over 107 to the third round. Also the fourth placed Daryl Gurney does not pass the second round: John Henderson is too strong and takes a 4-2 victory over the winner of the World Grand Prix. Vincent van der Voort, after his win against Dave Chisnall, also wins against Steve Beaton without set loss and goes on to the last sixteen. Michael van Gerwen will not lose any leg against James Wilson, but the biggest achievement is almost provided by qualifier Paul Lim: the man who threw the first (and only) 9-darter ever at Lakeside in 1990, misses the double twelve to write history again in his match against Gary Anderson. In the end, the Singaporean man loses 4-1 to the two times world champion. Rob Cross and Michael Smith make it an absolute spectacle in their match with 29 180-ers. Ultimately, Cross wins 4-3 after Smith has missed two matchdarts. In the third round the canvas falls for Vincent van der Voort. After a strong start, he eventually has to acknowledge his superior in fellow countryman Raymond van Barneveld. Michael van Gerwen wins with difficulty from Gerwyn Price, after he sees the Welshman missing three darts to take a 3-2 lead in sets. The fifth placed Mensur Suljovic loses 4-0 against Dimitri van den Bergh, while Phil Taylor gives a strong performance against Keegan Brown. Rob Cross has no problems with John Henderson and also Darren Webster, Jamie Lewis and Gary Anderson know how to go to the quarter finals. It is striking that during the third round no match needs a deciding set. On the day of the quarter-finals, two surprising matches are scheduled for the afternoon session: Jamie Lewis pulverizes Darren Webster 5-0 and goes to the semifinals of the World Championship for the first time in his career. Rob Cross wastes a 4-1 lead against Dimitri van den Bergh, but eventually manages to win 5-4 against the young Belgian. During the evening session the meeting between Raymond van Barneveld and Michael van Gerwen is on the program. Van Barneveld misses many chances, especially at the beginning of the game, and that will cause him to break up later on. 'Barney' still knows how to fight back nicely to 4-4, but again he fails at the decisive moments. Van Gerwen eventually wins 5-4, but he does not play 100% convincingly for the second game in a row. During the last quarter final, Phil Taylor and Gary Anderson will compete for a place in the last four. Taylor looks just a little sharper than his Scottish opponent and knows how to beat him: 5-3. Phil Taylor manages to reach the final during his very last tournament. 'The Power' retires after the World Championship and is determined to add a seventeenth world title to his impressive palmares. In his semi-final match against Jamie Lewis, the Englishman starts 1-0 behind, but then the legend let his experience speak. Taylor wins six sets in a row and will reach the final of the PDC World Championship for the nineteenth time. In that final, Taylor takes on Rob Cross. The Englishman who has only been competing in the PDC circuit since this year sees his good year being crowned with a place in the World Championship final. During the semi-finals he fights an insane battle with Michael van Gerwen. After the first eight sets have gone with the darts, the title holder takes the ninth set who was been sterted by Cross. Van Gerwen seems to be able to walk out to victory, but then loses his own set to Cross. Also in the deciding eleventh set, both men do not care much for each other: an all-deciding eleventh leg has to be played, after Cross has missed one matchdart and Van Gerwen has already missed four chances. Also in the final leg there is plenty of tension: Cross misses the double ten for a 140-finish, after which Van Gerwen does not manage to hit the double sixteen with one dart. In the end it is Cross who hits his third matchdart, and places himself for his first World Championship final and Van Gerwen loses his title after one year. The final will enter the books as the last of Phil Taylor against the first from Rob Cross. Where many people hope for a final piece of art from 'The Power' is it Cross who is fantastic from start to finish. Via a 167-finish, 'Voltage' takes a 2-0 lead in sets. After that, he takes the third set with a 153-finish. After Taylor retains the fourth set, he starts the fifth set with two 180-ers. The man who never threw a nine-darter at the World Championship doesn’t do that in his last game either. He misses the double twelve for the ultimate leg. Strikingly enough, the leg and a bit later the set goes to Cross, which throws out everything that appears in front of his eyes. He takes a 6-1 lead and is then one set away from the title. Taylor manages to win the eighth set with 3-0, but via a 140-finish Cross puts the 7-2 final score on the board. With that, after Dennis Priestley and Raymond van Barneveld, he is the third player to win his first PDC World Championship. In addition, after just one year he is already in the top three of the world: an absolute stunning performance.